As stated previously, we have been working with this client for many years. This allowed us to build a strong rapport with them as we grew their online marketing reach. They are a B2B consulting company with over 30 years experience in their field. We have been able to build on that notoriety to continue to grow not just their site traffic but their sales pipeline as well. As a small business, the company CEO served as the administrator, lead consultant, and sales department. Not surprisingly, this had him stretched thin. He was managing all of his sales through his email inbox, which led to many sales leads falling through the cracks and sometimes going months without a response. This lack of sales pipeline management also led to an inconsistent tracking of closed sales which ultimately threw off the sync of the entire company: staffing, employee capacity, availability, and budgeting all experienced volatility from this. As each month became more hectic for both us and the client, we realized, for both of our sanity, a solution was needed. Over six months before we began our sales acceleration engagement with the client, we began to nurture the idea of a comprehensive sales pipeline tracking solution as a way to clean up their process and close the loop in order to effectively track the ROI of our services. 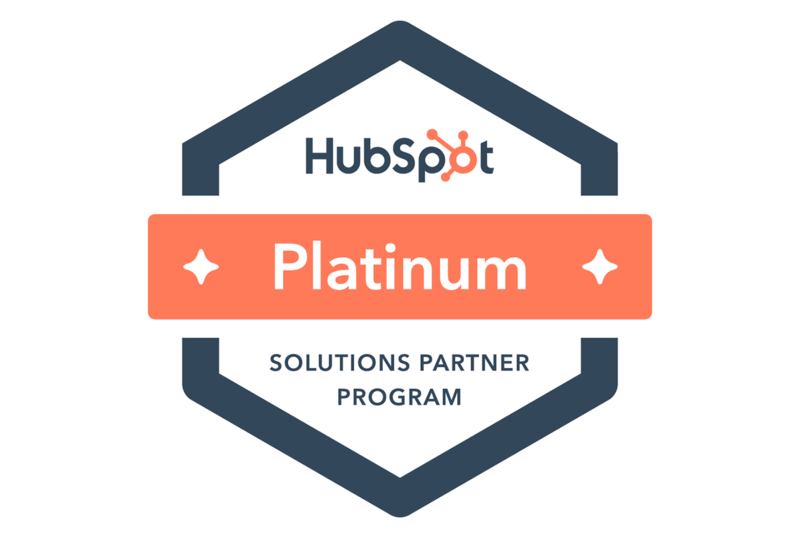 During this time HubSpot unveiled their CRM solution. We used this as a way to both introduce the client to the HubSpot platform while simultaneously providing the solution they so desperately needed: consistent, dedicated sales pipeline management. In deploying the HubSpot CRM we added a dedicated sales coach to the project. Our sales coach implemented the CRM and then began holding the client accountable for their sales process through ongoing pipeline and sales activity tracking and correspondence:starting with bi-monthly emails and eventually moving up to daily emails as our work together expanded. During the past year we also realized the client has two distinct sales processes for two different services they offer. This means we were able to split the sales pipelines into two separate pipelines which help to better inform the way the client manages the sales process but does not ultimately change how we track the overall numbers. For the first three to six months, we focused on making sure everything was operational within the CRM as well as working out a defined sales process with the client. This means that while the following numbers are extremely helpful, they actually do not fully represent the past year - meaning more leads and more sales did come in - mainly through previous customers or referrals but were not ultimately tracked. That being said, the numbers speak for themselves. Over the past year, we have tracked over $479,000 in net new customer revenue for the client which represent 86 closed deals. This is in addition to revenue from existing and referral customers. In that time we also currently have 44 active prospects who are in anywhere from an initial discovery phase to projects that are on hold to projects that are awaiting signature. While this information is notable, it is ancillary to the more in-depth knowledge of how those prospects were acquired and where the revenue was generated. 1: Where are the leads coming from? These numbers directly reference our former case study showing the increase in traffic and leads. We will now narrow the case study down to won leads by source. 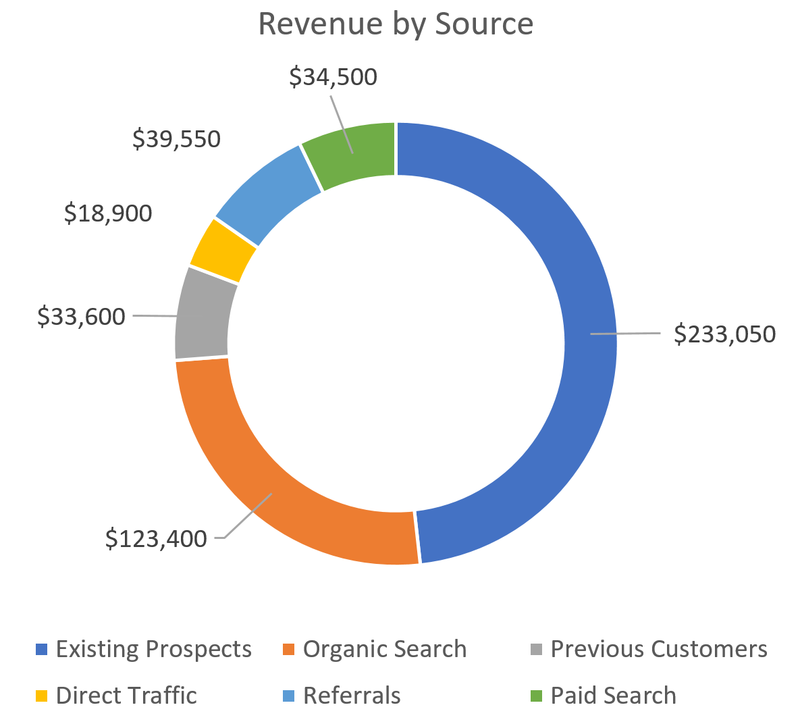 Then we will narrow the case study down even further to show which of the three services the client provides are making the most money and what lead sources are driving that revenue. 2: Where do the won sales come from? This means there is a slight higher probability that we are going to close existing clients than we will close net new leads. This is not surprising. I would further postulate that if we were to look at these numbers over two to three years, the number of existing clients or former prospects would grow. Furthermore, this does not take into account a company that would be considered an existing client that before the lead came in did not previously exist in the database (ie. a new hire or a different division of the company). These numbers are extremely insightful, but we can actually take it a step further. We can also break down the 58 won sales from online sources based on their specific online origin. 3. Which source sold what? For confidentiality reasons we will refer to the client’s three services as Service 1, Service 2, and Service 3. Service 1 is the largest service and has a relatively long sales cycle (in some cases 12-16 months in length), Service 2 is a mid-size service that typically takes three to six months to close, and Service 3 is a small service with a sales cycle only a few days long, excluding payment and registration logistics time. For the sake of length we are not going to walk through a breakdown of every purchase, but we want to note some key takeaways from the data. All of the direct traffic and previous customers purchased Service 3. This makes sense because people are ready to purchase this service when they come to the site and more than likely are coming to the site exclusively to purchase the service. Additionally, the Service 1 package is typically purchased by a particular company only once, but returning customers would need to purchase Service 2 every three to four years, and Service 3 nearly every year. All of the referral customers ended up purchasing Service 2. This could be either because our client is one of the best in the business related to Service 2 or the people who referred the customers had good experiences with previous purchases of Service 2. For the customers originating from organic search, nine of the purchases were for Service 3, three were for Service 2, and four were for Service 1. For the existing prospects, nearly half of the purchases were for Service 3, while most of the rest were for Service 2. Now that we know all of this information, it is time to adjust. Most importantly, we are now taking this data and planning out how to better allocate our PPC budget. The first thing we will do is double down our PPC spend on Service 2 and Service 3, as those have more opportunity to scale due to their standardized scoping and shorter sales cycle. One of the things we can champion is our organic search reach. This shows us that everything we have seen through our marketing retainer with this client has paid off. Moving forward, this means we will continue to focus on growing the client’s organic search reach. Specifically, we will adjust our focus to growing the organic reach surrounding the services which are performing the best organically. Over the next year we will continue to work on shoring up the sales process and are looking to implement new forward-looking outreach to our client’s former prospects in order to ensure they are putting themselves in front of them right as they need our client’s services. We are extremely proud of what we have been able to do with this client. We were able to track the sales down to the specific service and price point. This helps us to not only justify our services but to further adjust our services to provide even better results for our client. 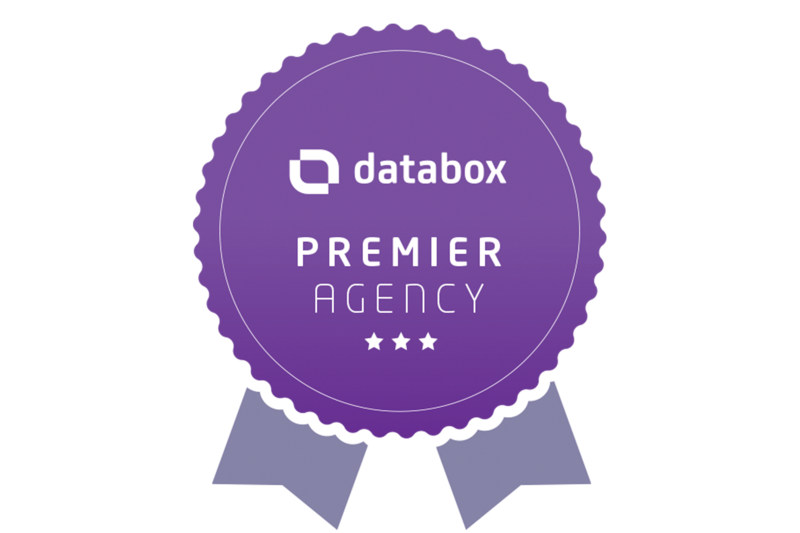 If sales acceleration is a service you feel your business could benefit from, contact us and we'll talk.